Forum » AffordableCebu.com Lobby » Current Events » Be Prepared for Typhoon "Megi"
Be Prepared for Typhoon "Megi"
Weather disturbance "Megi" (local codename: Juan) could bring the same amount of rain as Ondoy, the Philippine Atmospheric, Geophysical and Astronomical Services Administration (PAGASA) said on Friday. In a press conference, PAGASA chief Graciano Yumul said the storm has intensified into a typhoon with maximum winds of 120 kilometers per hour and gusts of 150 kph. It is moving west northwest at 20 kph. “If it enters, it would be a typhoon category. Ondoy is a tropical storm category. Ondoy would actually be of a lesser strength. However, if you start looking at the amount of rainfall that Juan is going to bring, satellite imagery shows that the amount of rain it’s bringing is basically similar to what Ondoy had dropped in Metro Manila,” Yumul said in a press briefing. Ondoy dumped one month's volume of rain in just a few hours on September 26, 2009, flooding large parts of Marikina, Pasig, Quezon City, Manila, Caloocan, Muntinlupa and surrounding cities. The storm killed 464 people, affected nearly 1 million families and left P11 billion worth of damage to infrastructure and agriculture. Yumul said Megi is forecast to enter the Philippine area of responsibility by midnight or early Saturday and would most likely made landfall in the Cagayan-Isabela area. He said the forecast track line shows that the storm would affect Cagayan, Isabela, Kalinga, Apayao and Abra and ultimately exit Ilocos. He said PAGASA could hoist a storm warning signal by Sunday morning. He said the storm may or may not be felt in Metro Manila. “Of course, we are making sure that even people in Metro Manila are prepared for the simple reason that if the track line of tropical storm Megi would be deviated to a lower track line, then Metro Manila for that matter would be along the path of the track line,” he explained. PAGASA Deputy Administrator Nathaniel Servando said Megi could gain more strength even before it enters the Philippines. “Considering na nasa labas pa lang siya ng Philippine Area of Responsibility pero na reach na niya yung typhoon intensity, definitely mag i-intensify pa ito further and before landfall maaring umabot o higit pa sa 150 kph,” said Servando. 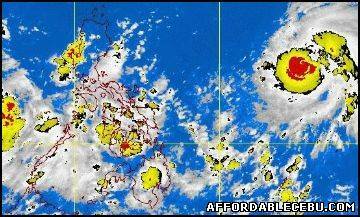 PAGASA said it came out with an early forecast to prepare the public especially those in Northern and Central Luzon. “By Sunday afternoon, we will have more or less a firm idea in terms of the amount of rain, in terms of the speed and in terms of the areas affected,” Yumul said. On Friday, the weather bureau met with the Office of the Civil Defense and sent out warnings to fisherfolk along the eastern seaboard of northern Luzon. They also issued warnings to farmers who will soon be harvesting their crops. “It's a recommendation, but if you start looking at the available MTSAT [Meteorological Satellite], right now, you can see that the wave height and winds are actually starting to get strong along the Philippine sea,” he said. PAGASA advised the general public and local disaster risk reduction managers to prepare and take precautionary measures. Travelers were advised not to travel starting on Sunday morning, particularly in landslide prone areas of northern and eastern Luzon.